I’m constantly amazed at the seemingly boundless possibilities of stagecraft. Even without the benefits of an elaborate set, a good director , cast, and creative team can make a world come alive onstage and let the members of the audience fill in the details with their imaginations. It’s exciting to see what the enterprising minds of the creators can produce. 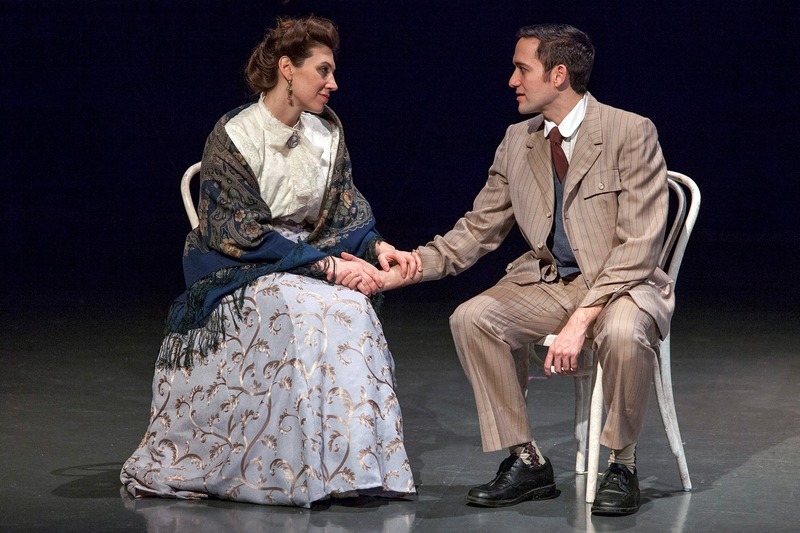 St. Louis Actors’ Studio’s stage adaptation of Kate Chopin’s The Awakening is an excellent example of such a fully realized, although minimalist, production. Even though the story is quite long and there’s more talk than action, it’s an enjoyable and thought-provoking piece of theatre that provides a window into life among society’s elite in the late 19th Century South. Presented at the Missouri History Museum and based on the most famous work of the celebrated writer and St. Louis native Kate Chopin, The Awakening takes its audience to the genteel and highly regulated upper class society of late 19th Century Louisiana, with its elegant balls and gatherings, leisurely afternoon strolls, and rigidly defined gender roles. In the midst of the summer season at the beach resort on Grand Isle, we are introduced to Edna Pontellier (Emily Baker), the wife of wealthy businessman Leonce (Terry Meddows) and mother of two sons. Edna at first appears detached and melancholy in contrast to her more vivacious friend Adele Ratignolle (Maggie Murphy), who seems much more content in her society-dictated role than Edna does. The initially nervous and reserved Edna is soon shaken out of her resigned existence through an intense reaction to a musical performance by the renowned and eccentric pianist Mademoiselle Reisz (Christie Mitchell) and a growing attraction to a longtime family friend, the earnest and seemingly aimless young Robert Lebrun (Antionio Rodriguez). Edna’s reaction to these new found emotional responses is a quest for self-discovery that takes her to the edges of polite society and, in the play’s second act, into the more Bohemian fringes of New Orleans life. As Edna struggles with her image of herself in contrast with society’s expectations, and her personal relationships and perceptions of her husband, children and friends old and new, she is forced to confront the realities of life in such a strictly defined world and decide how, and whether, she fits into that world. I’m still somewhat in awe of the visual design of this production. Here, removed from STLAS’s usual space at the Gaslight Theatre and brought onto the somewhat stark setting of the History Museum stage, the designers have worked a visual wonder. 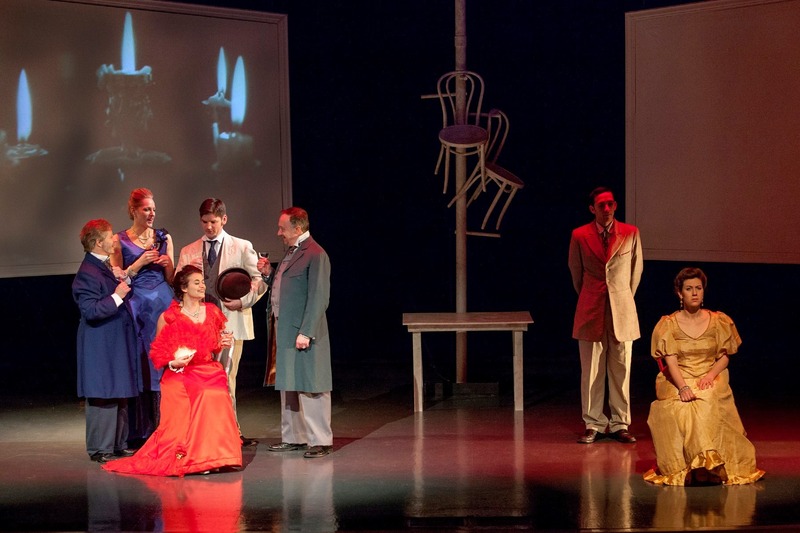 The set (designed by Patrick Huber) consists mostly of a table and four chairs, which are artfully arranged on a pillar in the middle of the stage and taken down and brought into the scenes as needed, and two video screens. The rest of the setting is provided by Teresa Doggett’s beautifully detailed costumes, Michael B. Perkins’s excellent mood-setting projections, Patrick Huber’s atmospheric lighting, and Robin Weatherall’s sound. All these elements together set the tone for this production and provide for some intensely striking moments such as a particularly dramatic scene in the second act that takes place behind a screen, lit so that the actors are seen only as larger-than-life shadows. That’s only one example, however. From start to finish, all these technical elements work together with the strong performances of the cast to present this thought-provoking and intellectually challenging story. Even though the pacing is a bit slow at times, and the show is a little over long, the performances and stunning technical elements keep the audience engaged. As for performances, the central figure in this play is Baker’s enigmatic Edna. With a remarkably expressive voice and facial expressions that provide an ideal window to the character’s thoughts, Baker carries the show well, portraying a fully believable journey from the reticent, emotionally evasive Edna of the beginning, to the her growing sense of wonder and thirst for experience, to her confusion and conflicted affections and devastating final scene. Edna is easy to understand in some respects (her feeling of suffocation in her expected role in society, in which she had very little choice), but the way she goes about her discovery sometimes comes across as selfish, although Baker manages to keep the character sympathetic. There’s a great scene in the second act where Edna tells a story to her children involving a tiger escaping from its cage that is clearing meant to be a metaphor for Edna herself, and Baker’s energetic and hopeful in her delivery. I also particuarly enjoyed her scenes with Rodriguez’s passionate and conflicted Robert, and Mitchell’s larger than life and richly characterized eccentric musician Mademoiselle Reisz. Rodriguez portrays Robert’s struggle between nobility and desire convincingly, and Mitchell presents a memorable and thoroughly credible portrayal of a Victorian-era Bohemian artist. Murphy, as Adele, gives a warm and effervescent performance that grows in depth as the story progresses. Meddows infuses the difficult role of Leonce with a intriguing contrast of capriciousness and humanity. He’s a man of his time, caught up in his billiard games and dinners at his club while content to foist most of the child-rearing duties on his wife. It’s an ill-suited match, although Meddows manages to make me believe that, in his way, Leonce does love Edna despite not being able to understand her. There’s also a nice turn by Nathan Bush as the suave womanizer Alcee Arobin, who crosses paths with Edna in New Orleans. This is a somewhat difficult play, in that I think I know what it’s trying to say and I agree with a lot of it, but some of Edna’s actions aren’t easy to understand. Not having read the book, I only have this play’s representation of the character and her story. She seems to care for few people other than herself and doesn’t seem to think a lot about the effects her actions will have on others, but considering the world in which she was raised, I can more easily sympathize with her. It’s easy to romanticize the Victorian era with its beautiful clothes, richly appointed furnishings and style, but thinking about the strictly controlled societal conventions makes it seem a lot less pleasant. The men are free to do whatever they want, but the women are given little choice but to marry a (she hopes) nice gentleman, raise their children and do whatever her husband wants her to do, often living a pampered, childlike existence where the man makes all the “important” decisions often without consulting his wife. In today’s world where a woman has a lot more choices about how to live her life, a world like Edna’s can be hard to imagine, but it was a reality for so many women in 19th Century society. This production presents the dilemma of that existence clearly, even though it’s at an extremely leisurely pace most of the time. Still, with its excellent cast and truly astounding technical production, The Awakeningis well worth watching, and is sure to provide a lot to think and talk about after the show.